This take on a sweet and crunchy bar uses whole grains, apples, vegetables and a touch of honey. Try the recipe next time you need something to fill the lunchboxes and hungry tummies. 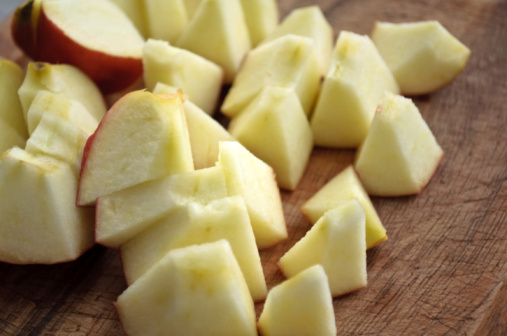 WASHINGTON – Few foods represent fall as well as apples: crisp, familiar and perfectly portable for snacks on the go. But some days, the 4 p.m. apple won’t cut it. You need something heartier to tie the kids over from school to soccer practice, and you need something to keep yourself from heading to the vending machine in the afternoon hours at the desk. That’s where these homemade snack bars come in. This take on a sweet and crunchy bar uses whole grains, apples, vegetables and a touch of honey. Try the recipe next time you need something to fill the lunchboxes and hungry tummies. Place the diced apple on a paper towel and spritz with lemon juice. Set aside. Combine all remaining ingredients in a bowl and stir to combine. Pour into an 8- inch square baking dish and sprinkle drained apples over the top. Bake for about 20-25 minutes, until golden brown, and remove from oven. Cut into squares but do not remove from pan — let the bars cool in the pan. They freeze well too. Additions I love include 1/4 cup of any/all of the following: finely chopped almonds, shredded coconut, raisins, sunflower seeds and dried cranberries. Mary Beth Albright is the author of “How Apples Grow: The Grow Your World Series.” Albright is a frequent contributor to WTOP, and works as a local food lawyer and food expert.